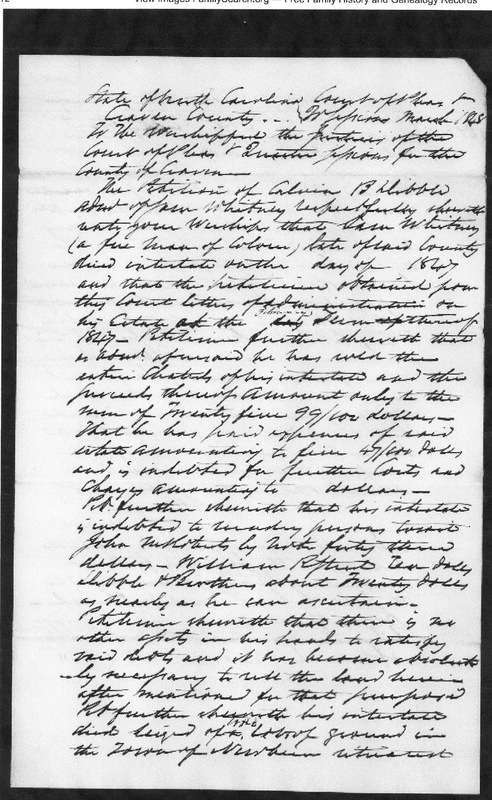 Amanuensis Monday: More From Samuel Whitney's Estate Record. Okay folks, this estate record for the man I suspect is my 4th great grandfather has been driving me crazy. I have been staring at it and staring at it and have had a difficult time making out a good portion of it. Just look at it. LOL! Somehow on Sunday, my eyes were able to start to see the words a little bit clearer and so I started transcribing. This is from page 31 of the file. "North Carolina Estate Files, 1663-1968" index and images"
State of North Carolina Court of Pleas for Craven County (word?) March 1848 (the worshipped?) the justices of the Court of New Bern & Quarter (Opinions?) for the County of Craven. The Petition of Calvin B. Dibble (Admin?) of Sam Whitney respectfully observath on to your worships that Sam Whitney (a free man of colour) late of said County died intestate on the (space) day of (space) 1847 and that the petition obtained from this court letters of administration on his estate of the February term thereof 1847. 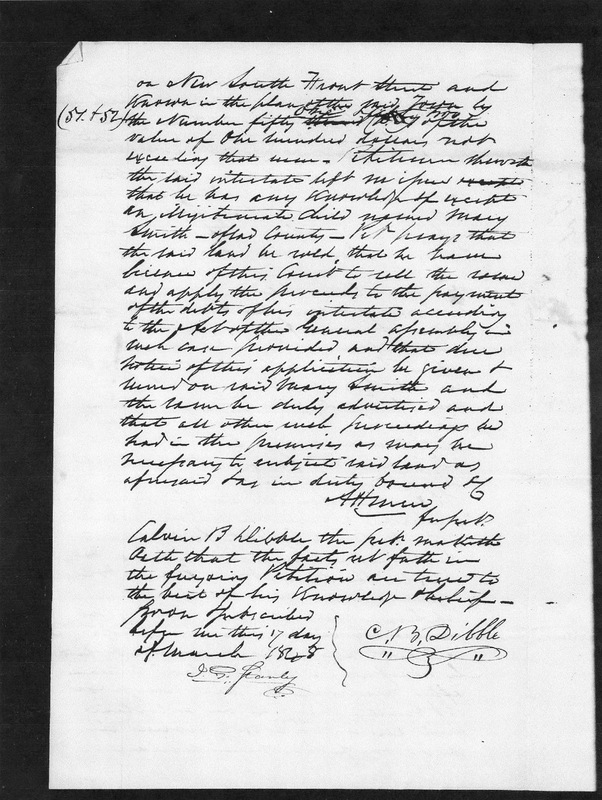 Petitioner further observath that as admin aforesaid he has sold the entire chattels of his intestate and the proceeds thereof amount duly to the sum of twenty-five 99/100 dollars-That he has paid expenses of said estate amounting to five 47/100 dollars and is indebted for further costs and charges amounting to (blank) dollars. Pet (abbreviation for petitioner perhaps?) further observath that his intestate is indebted to (usury?) persons to most John (unsure of name) by worth forty three dollars---William (unsure of name) ten dollars Dibble & Brothers about twenty dollars as nearly as he can ascertain. Petitioner observath that there is no other party in his hands to satisfy said debts and it has become absolutely necessary to sell the (word?) herein after mentioned for that purpose . I have to stop the transcription here because my eyes are falling out of my head and that I am dying to share something I just found out.